Finally, it feels like Spring! 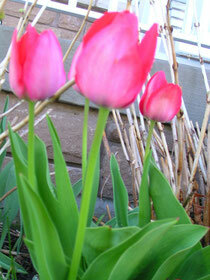 My tulips are starting to look fantastic in the garden. Gardening is a therapeutic way to spend your time. I often find that when I'm gardening I am in the moment. Stressors of the day seem to fall in the background. Reiki is very beneficial especially when gardening. Reiki can help with those aches and pains in the knees and back which come to life after a day spent weeding and digging.